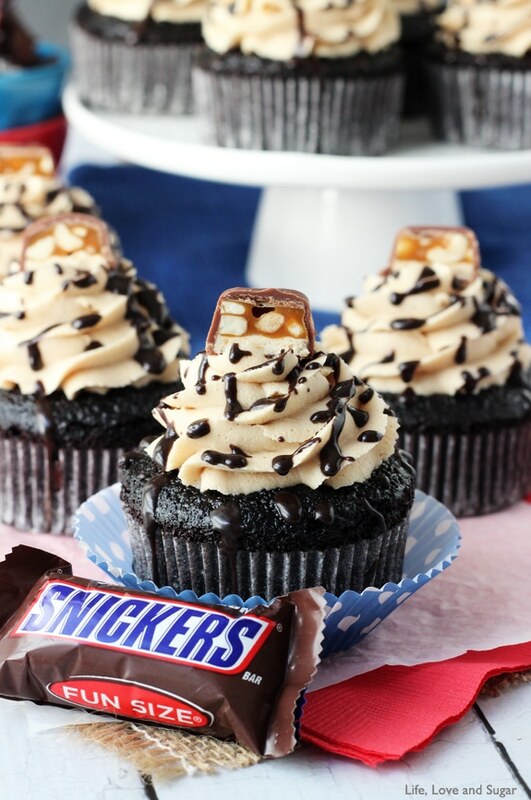 These Snickers Cupcakes are over the top! 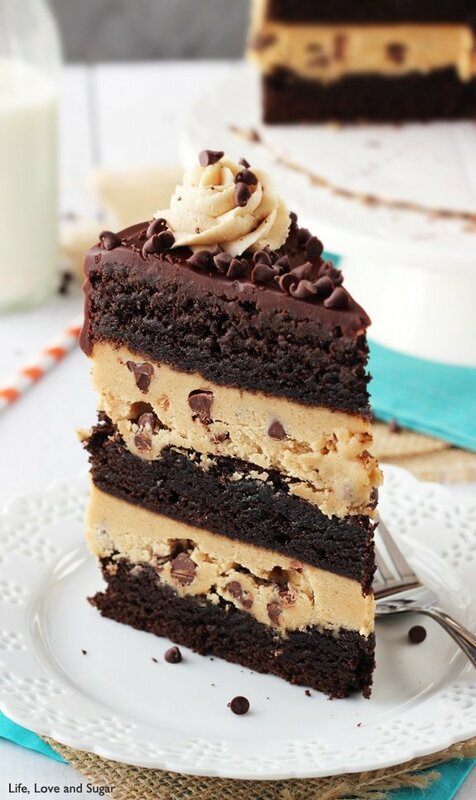 Delicious, decadent, chocolatey, caramel-y, peanut butter-y and rich! And oh so good! Now before I too much into the cupcakes, I want to talk Divergent again. If you are reading them and don’t want any spoilers, skip ahead. Last week, I mentioned that I was almost done with the third book in the Divergent series, Allegiant. I have finished. And I am not a happy camper. It didn’t have to end that way! Seriously! It didn’t make anything better or change anything about the story. No, it just made it sad for the sake of being sad. Not cool. The author clearly hates happiness and happy endings. Ok, so that’s probably not true about the author, but why else would she rip our hearts out with such a sad ending? WHY?! 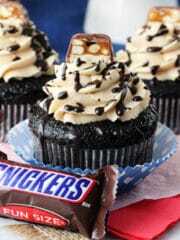 So back to the snickers cupcakes! I started with my very favorite chocolate cake recipe. It is the most moist, delicious and fluffy chocolate cake. 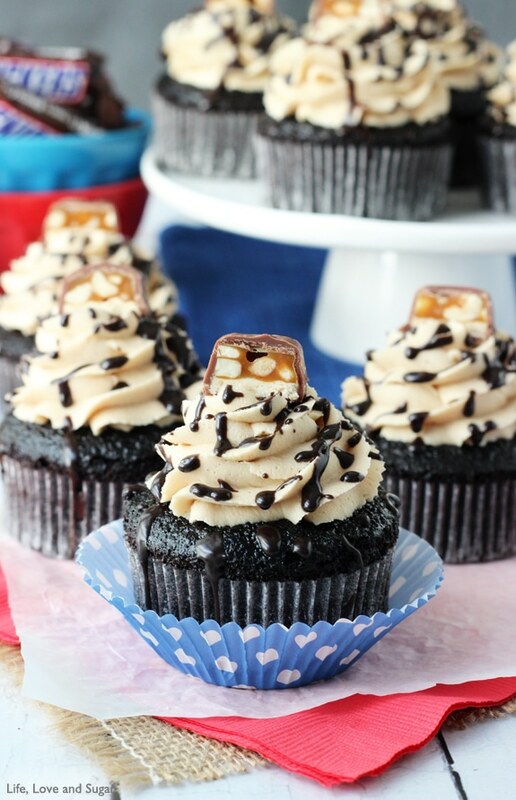 I use Hershey’s Dark Chocolate Cocoa, which is why these cupcakes are so dark. You could use regular cocoa, but I did that once and will never do it again. The dark is the way to go. Even if you don’t care for dark chocolate in bar form, it makes for the best baked goods. Then I moved on to the filling. You guys, I could eat the filling straight. SO good! 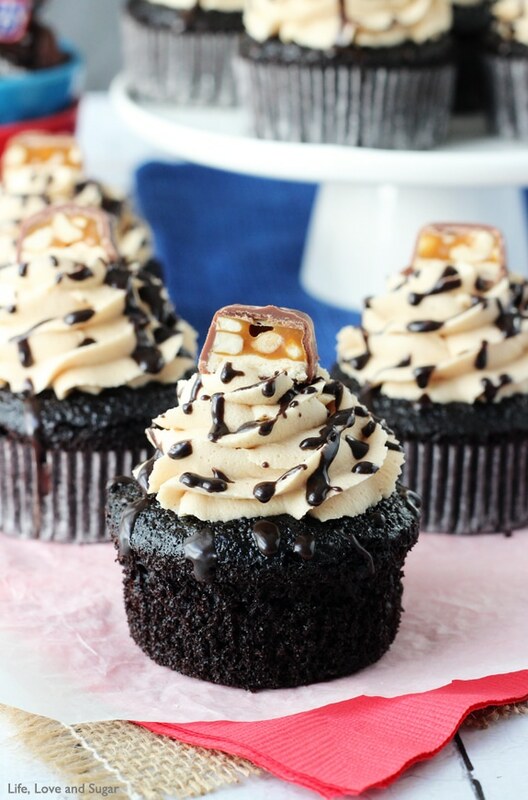 I wanted to really give these cupcakes and real Snicker-y feel. Just cake and icing wasn’t enough. And since the inside of Snickers are filled with caramel, peanuts and nougat (which is kind of like thick marshmallow), I made a filling modeling that yumminess. The peanut butter icing is variation of my normal buttercream with peanut butter added in. 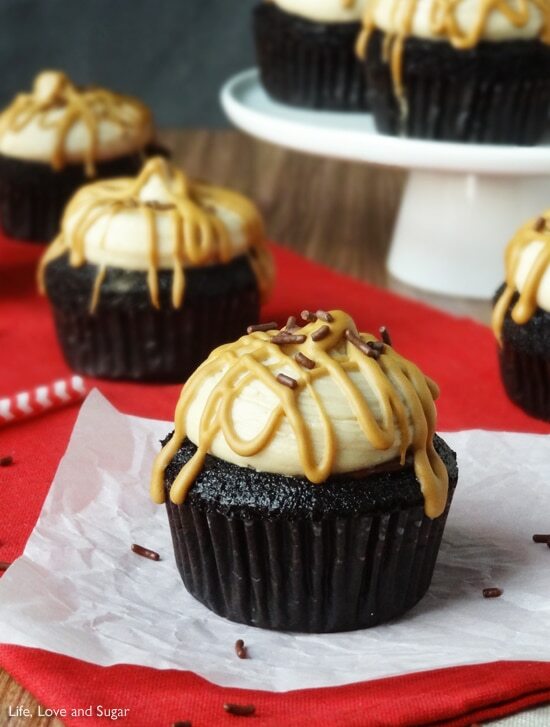 If you are more into the caramel though, instead of peanut butter, you could totally make the caramel icing from these cupcakes. Also totally yummy! And because no dessert is complete without a chocolate drizzle, I’ve got one of those too. And a cute little half of a mini Snickers to finish it off! So stinkin’ cute and so freakin’ delicious! It these don’t satisfy your sweet tooth, I don’t know what will. 1. To make the cupcakes, add all dry ingredients to a large bowl and whisk together. 2. Add egg, buttermilk and vegetable oil to the dry ingredients and mix well. 3. Add vanilla to boiling water and add to mixture. Mix well. 6. 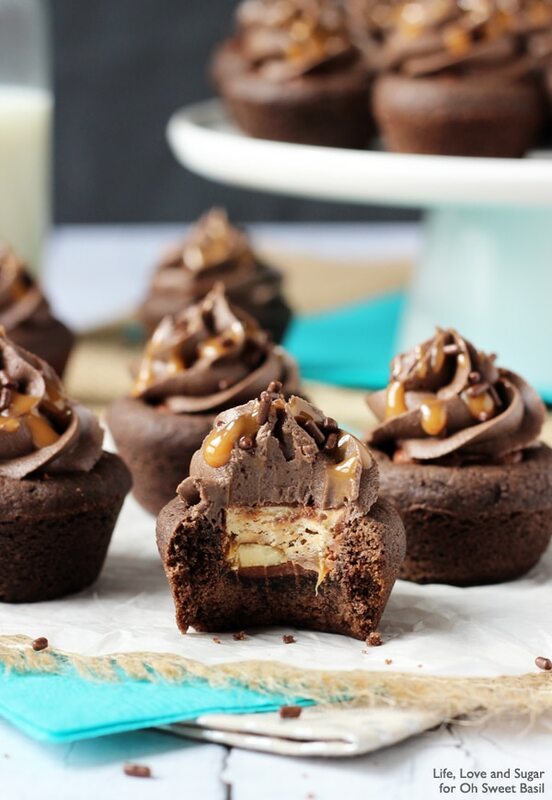 While cupcakes cool, make the filling. Add milk, butter and caramels to a pot over medium heat and melt, stirring constantly. 7. Once melted and smooth, add peanuts and marshmallow fluff and stir until combined. 8. Remove from heat and allow to cool and thicken for about 30-35 minutes. 9. Once cupcakes are cool and filling is ready, cut out a hole out of the top part of the cupcake to add the filling. 10. 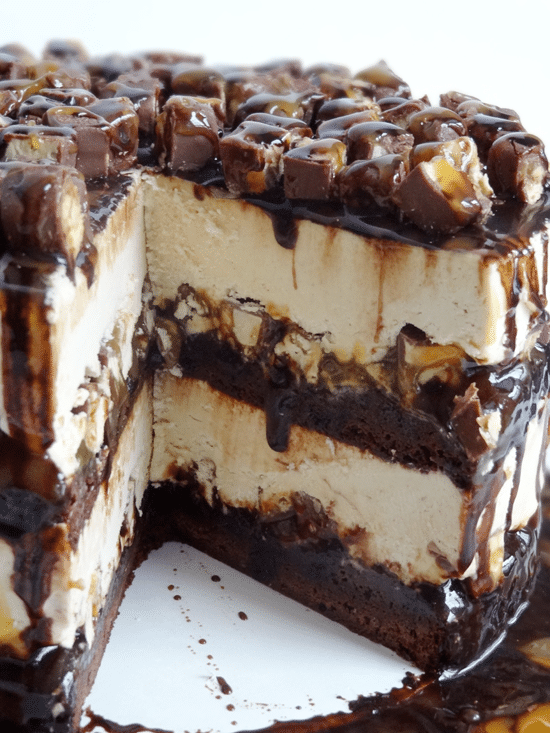 Fill the hole with the caramel filling. 11. To make the icing, beat the shortening and butter until smooth. 12. Slowly add 3 cups of powdered sugar. Mix until combined. 13. Mix in the vanilla extract, peanut butter and 1 tbsp water or milk. 14. Add the rest of the powdered sugar and mix until smooth. Add more water or milk until the right consistency. 16. To make the glaze, whisk together powdered sugar, cocoa and milk. Drizzle over cupcakes. 17. 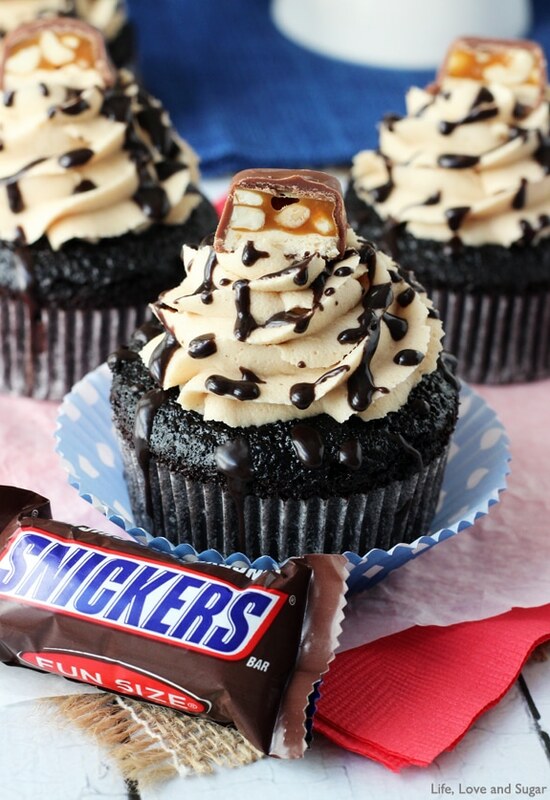 Top cupcakes with half of a mini Snickers. Definitely – snicker overload here! Thanks for the pin Rachel! These cupcakes look fantastic! What a delicious filling and frosting! That candy bar on top is giving me a beckoning look. Pinch me! These have to be the best looking cupcakes I’ve ever seen. Snickers make me weak at the knees, they’re my absolute favorite! Wow, thank you so much Sally! What a compliment! 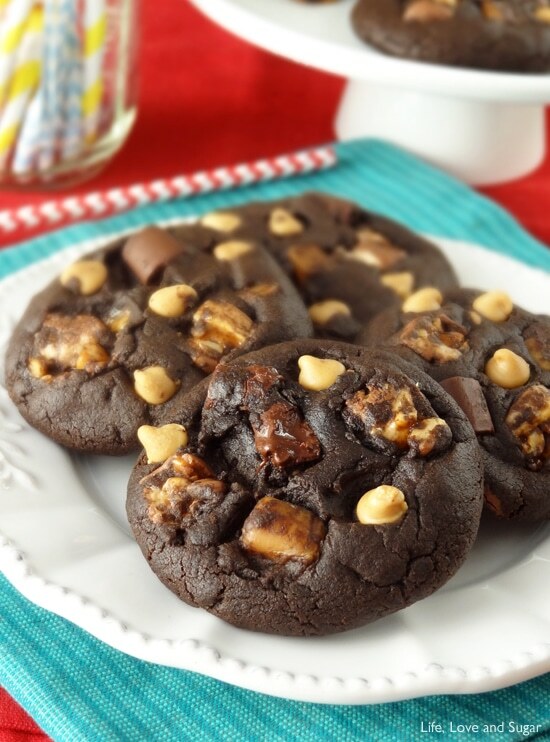 🙂 Snickers are a favorite of mine too – especially to bake with! Just found your blog last night and I’m officially addicted! Everything looks and sounds amazing plus your pictures are stunning! 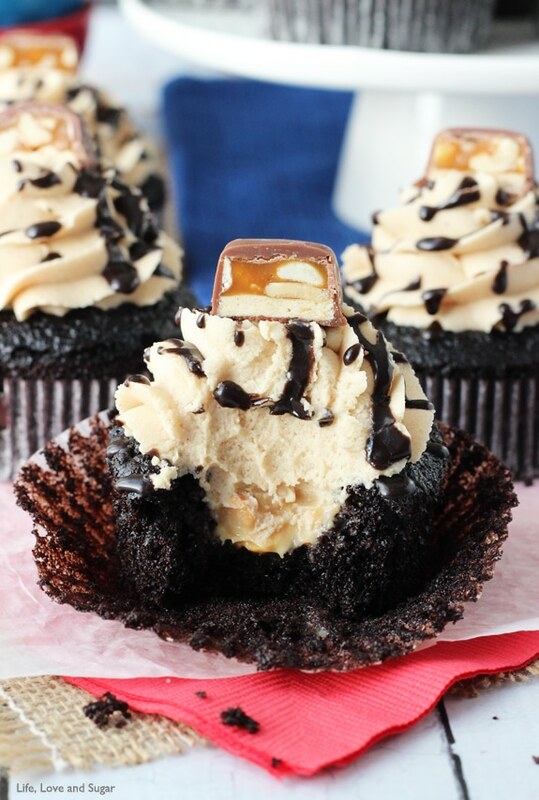 These cupcakes look perfect – you’re making me drool! Holy cow!!! Now that is one crazy awesome looking cupcake!!! Gorgeous!!!! 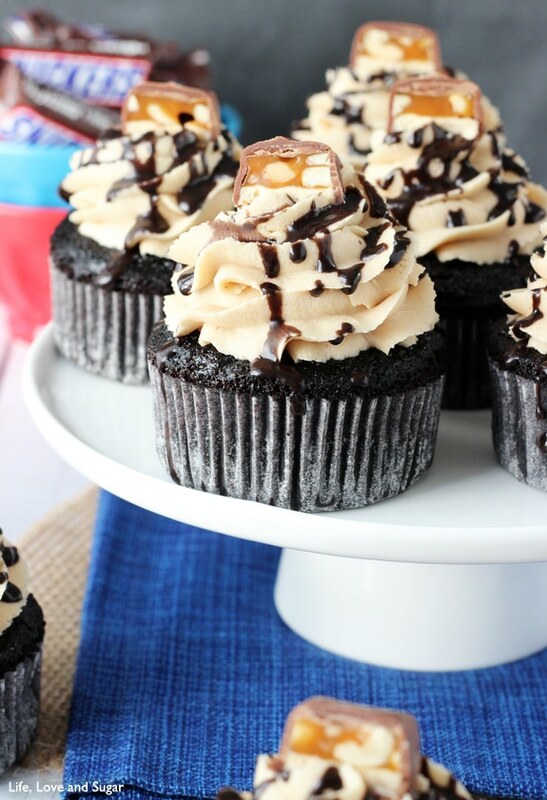 Love how rich and decadent these cupcakes are! They are gorgeous! These cupcakes seriously have me drooling Lindsay! Pinned and shared on FB! Lindsay, I’m in love with the fact you chose to use Hershey’s Dark! I always make sure I keep some in the pantry. Although, I wish Costco would sell it in bulk like they do with the regular one. Divergent seems like a great read… definitely going to have to go check it out! I’m sorry you’re having trouble finding them. I usually find them at the grocery store or WalMart. You could substitute with homemade caramel and it should work well. Here’s a recipe to try. These were really good. The caramel filling was surprising super delicious and spot on to a snicker’s bar. Wow. The chocolate cake was very moist and rich as well. I didn’t follow the peanut butter frosting recipe just because I try to omit shortening. Very, very tasty and will make again. Thanks for a great recipe. So glad you enjoyed them Nadia! My snickers filling is not as fluffy as the picture. Do you know what I can add to make it thicker? More marshmallow? I made these and absolutely loved them! However, when I made the cupcakes they did not rise well. They flattened out over the sides rather than having a rounded top. I double checked the recipe and followed it exactly aside from the dark cocoa. What tips do you have? It sounds like the cupcakes may have been a little too full. If they overflow like that, I’d suggest a little less batter per cupcake. I’m glad you enjoyed them! I made 44 of these for my daughters 13th Bday party tomorrow night, thank you so much for a awesome recipe. They taste divine. Whew! 44! 🙂 I’m glad they were enjoyed! 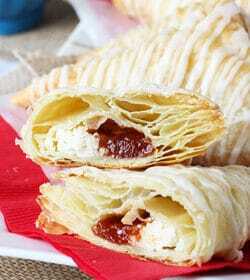 Made these tonight but the cooking time and temperature didn’t work for me. I baked them at 300 degrees for 23 minutes and the batter was still wet. When making these, i noticed the batter was a bit more runny than usual. Is this consistency correct? You can find the full chocolate cake recipe here. Does this recipe (or your new “Moist Vanilla Cupcake) change at all if you are baking mini cupcakes instead of the standard ones? You’ll just want to adjust the baking time. 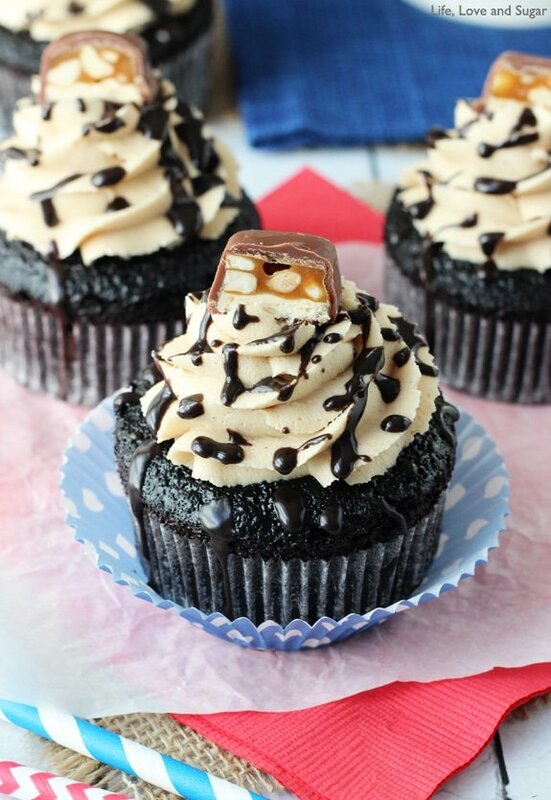 I used just the cupcake recipe for chocolate cupcakes and buttercream frosting…. these were incredible!!! They were the most moist, rich, decadent cupcakes I’ve had! Even better than bakery cupcakes my husband said! Definitely pinning for future use, and will even write the recipe down to keep away in my recipe book. Will doubling this recipe require any adjustments with ingredient measurements? It should be fine to double as is. Thanks! In response to two other posts, I suggest only filling the muffin cups halfway. I couldn’t find Kraft caramels either, but did find Kraft “Caramel Bits” (worked great!) at Walmart in the baking aisle with chocolate chips. One person who ate these said it was the best cupcake he had ever eaten and they were the first to disappear at a cupcake dessert table at a fundraiser among a selection of about 20 different cupcakes! Bravo! I’m glad they were such a hit! Are you referring to this cake? The full cake uses 1 cup of oil, so it is actually cut in half in this recipe. I’m referring to the snickers poke cake. Ohh, I see. Those are two very similar, but slightly different chocolate cake recipes. There are other differences as well – like the cake uses both baking powder and soda. Also, these cupcakes bake at 300 degrees and the cake bakes at 350. Ultimately the cakes are very similar, but these cupcakes are honestly even more moist than the cake. 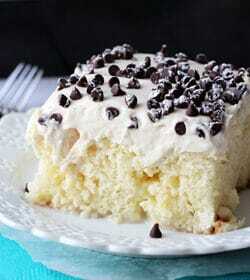 With a poke cake though, you’re adding even more moisture, so there’s plenty. Hi Lindsay- I’m new to your blog, but you’ve won me over. I was sick of using boxed cake mixes, and wanted to find an ultra-moist “from scratch” chocolate cake recipe. I made this tonight and it was far more than I expected! So delicious!! And so moist and rich!! Plus, the recipe was so easy! I’ll never return to boxed mixes again! Can’t wait to try your other recipes! Thanks again! I was wondering for the chopped peanuts if these are salted or non-salted? Also, do u find these already chopped like a Planter’s brand or do you chop these yourself? Just trying to understand how chopped they should be for the filling! Looking forward to giving these a try for Thanksgiving 🙂 LOVE your blog! Salted or non-salted should be fine. I believe I used salted and chopped them myself. I hope you enjoy them! Happy Thanksgiving!